Many of the ninja’s robot army has probably already seen this, the footage of the killer whale right before the attack. This was on one of the news stations the ninja watches, and it made him think. It really doesn’t matter how nice the whales are, there is a reason they are called killer whales, and this one has been responsible for several deaths. The footage of the attack shows the killer whale and its trainer, Dawn Branchaeu, moments before she was killed. Note: this footage does not show anything graphic, of nature, though it does show her feeding and playing with the whale. After the past deaths, this was against park policy, and trainer were not allowed to swim with the killer whale. This is a sad incident, and the ninja’s prayers go to the victim’s family. Some of you may be wondering what today is. Did you know that today is Presidents Day 2010? Well it is and that means you you are probably wondering if the places you frequent are open. Well since it is a Federal Holiday the post office is closed. But then the post office has more holidays that I can count. So that isn’t a big deal. That just means that you won’t be getting mail, and if you want to send some you will have to wait until tomorrow. Most other governments organizations will also be closed today, so if you need to take care of something you will have to wait until tomorrow. Banks, malls, grocery stores etc. will be open normal hours unless they think they need time off. Actually you might be able to find some Presidents Day sales today if you look around. But now you know that Fed. 15Th, 2010 is President’s Days. Wow, I just saw this a couple of minutes ago, and it really is rare. There has been an earthquake in Illinois measuring 4.3 magnitude on the Richter Scale. This has been on the news now for a little while, apparently the earthquake hit at exactly 3:59:34 a.m. According to the USGS originated 48 miles West North West of Chicago, Illinois and hit with depth of 3 miles. This would place the earthquake under Virigl Illinois, however, people also felt the tremors in: Batavia, Des Plaines, Naperville, Villa Park and Western Springs. For Chicago residents the quake was mostly felt in Logan Square and on the Northwest Side. Many residents report that they felt the ground move and heard items in their home being shaken around. Still, there has been no reports of damage or injuries caused by the IL earthquake. This isn’t a one of a time occurrence, however, in April 2008 the town of West Salem in the Southeastern portion of Illinois also experienced quakes. When the ninja was a little ninja, and even cuddlier he was fascinated by the crazy paranormal stuff. The Jersey Devil was one of the things that he was interested in. For those unfamiliar with what the mystical folk creature is, let me get you up to speed. 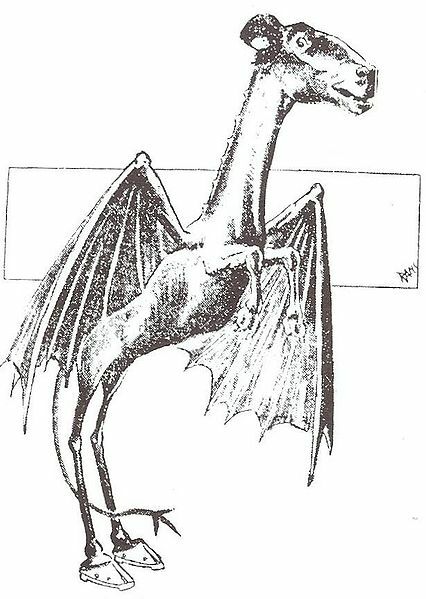 The Jersey Devil, sometimes referred to as the Leeds Devil is a cryptid, which is supposed to live in the Pine Barrens of southern New Jersey. It sort of looks like a horse or other biped creature with hooves. Though this is just one of many versions. It also has wings and is able to fly. Yeah, I know, if sounds like a something from “My Little Pony”. When you’re 8 though, that might just be enough to be frightening. The Devil has made an impact though on the area. No, it hasn’t laid waste to the area, spreading mischief and mayhem in its wake, that is my job. Instead it has inspired popular culture and even provided the name for the NHL hockey team in NJ. As the ninja got older the interest lessened and logic took over, now he can clearly tell you that what was once thought of as the Jersey Devil is nothing more than a ugly horse. Check it out for yourself. He is a 1909 drawing of the little devil. If you’re interested in reading up on the Jersey Devil here is the article on Wikipedia. Update: For all of you that don’t enjoy reading, here is an easier way for you to learn about the Jersey Devil, all you have to do is click play.